Marley Majcher, Founder and CEO of The Party Goddess!, has several great tips to show your guests you’re cool without breaking the bank! Also, she has included some facinating facts about our favorite Irish holiday. Welcome your guests! Wrap that old grapevine wreath from Christmas in Moss or clovers for a fun spring addition. The grass is always greener – on your side of the table. Get sheets of wheat grass or rolls of sod and create a vibrant green runner down your dining table or buffets. Release the Irish Spirits Create a fun green specialty cocktail. Have it be vodka or tequila based and add a splash or green juice and of course a sugared green or silver rim) or even get complicated and add some Midori or Absynthe. Pre-make them in pitchers for faster service and garnish with fun green candy. Kiddy Craft Time Got kids? Get them involved too by decorating their own leprechaun hats. You provide the plain hats and the fun pom poms and goodies and they can go to town! · The most famous legend regarding St. Patrick is that he rid Ireland of snakes by ringing his bell. · The actual color of St. Patrick is blue. Green, in Irish legends, was worn by fairies and immortals, and also by people to encourage their crops to grow. · It is believed that St. Patrick died on March 17th, the day that we now celebrate St. Patrick’s Day; the holiday got its American start in 1737 in Boston. 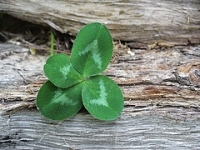 · The shamrock was a sacred plant in ancient Ireland because it symbolized the rebirth of spring. St. Patrick used the shamrock to explain the Christian doctrine of the Trinity to the Irish. · There are more Americans of Irish origin than there are Irish in Ireland. Delaware, Massachusetts, and New Hampshire Irish are the leading ancestral group. · On St. Patrick’s Day, you can bring yourself good luck by finding a four-leaf clover, wearing green and kissing the Blarney stone.